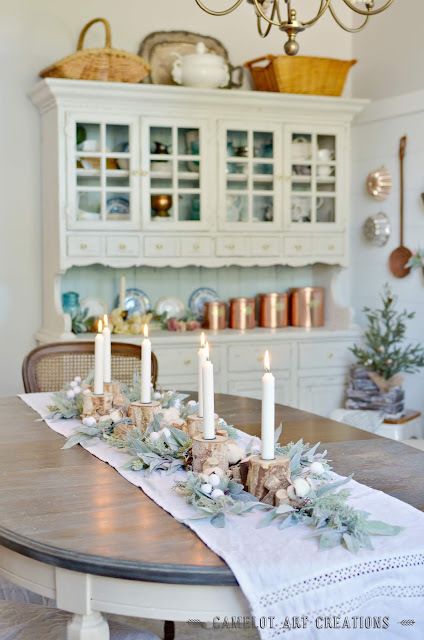 Lucky for us Floridians its been cold here and I've been adding some Winter touches around the house to add some warm and cozy vibes. 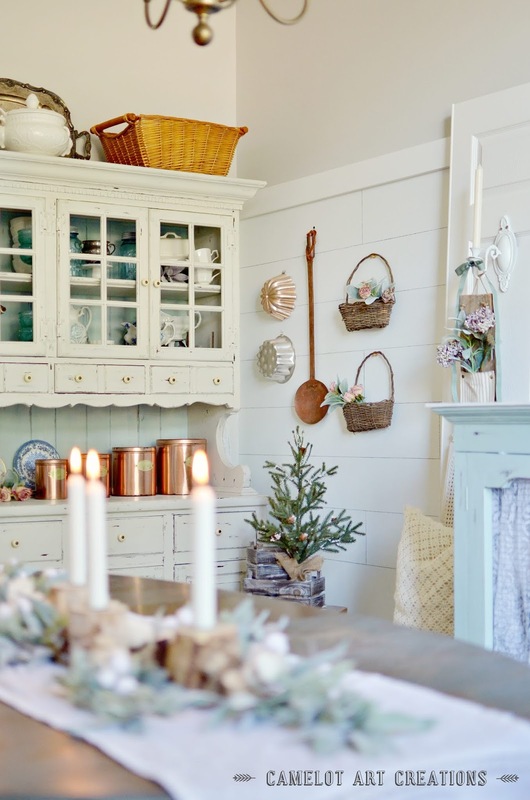 I always like to add natural elements for warmth like birch logs, wicker baskets, copper & cotton. 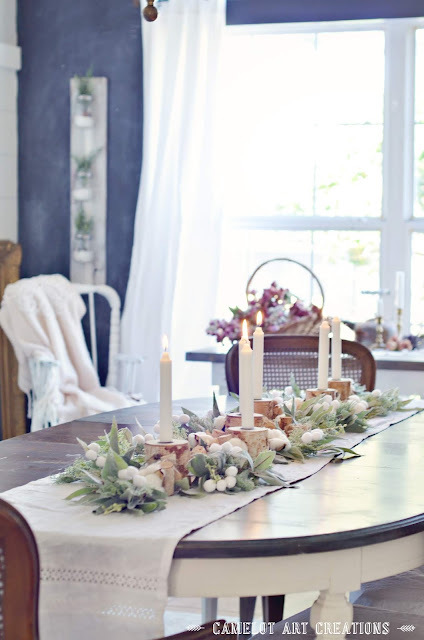 One easy way to add that cozy winter vibe is setting a table centerpiece. Not a whole tablescape but a little something on the table. The idea for this one is to be able to transition into a Valentines tablescape and Spring centerpiece. 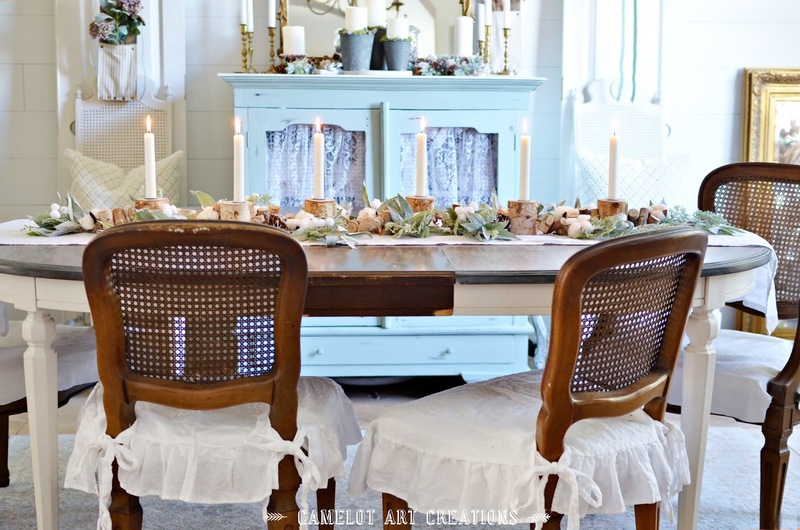 So stay tuned on how to do that from this Winter table centerpiece! Here is a list of the items I used for this centerpiece. 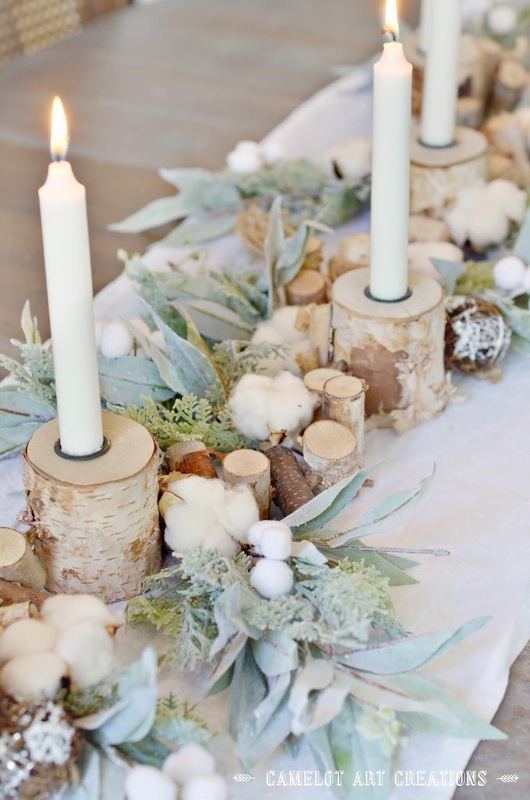 I LOVE the birch log candle holder garland! 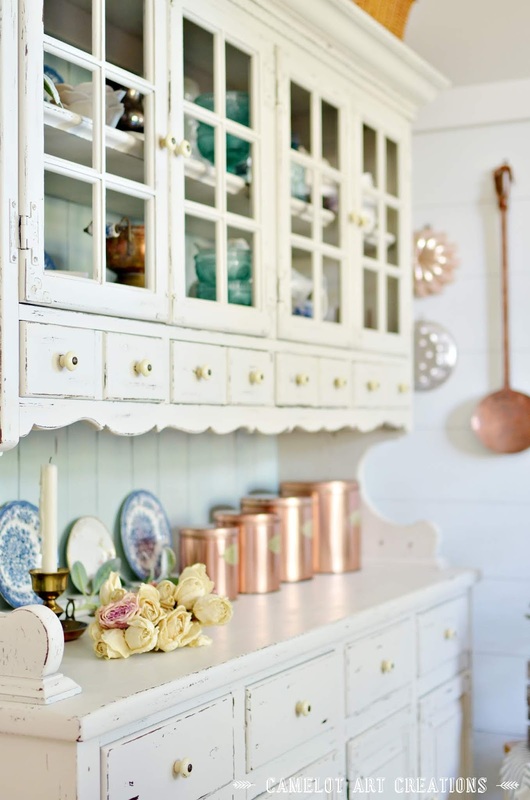 It's perfect for Winter but can also add that natural element for Spring. The candles fit snugly into the metal rings too. I hate when the candles don't fit in tightly and they lean to one side. 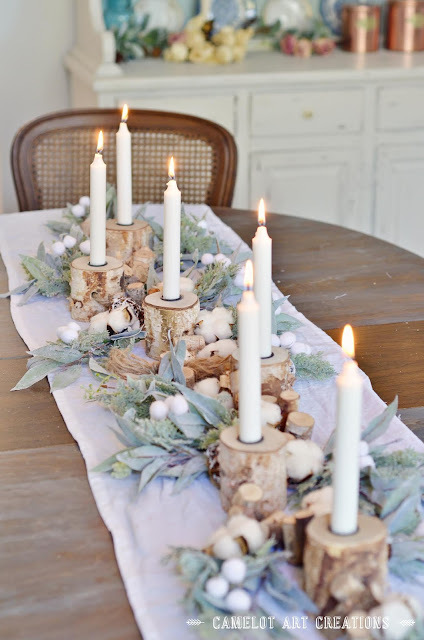 I staggered the two birch log candle garlands down the center of the table on top of a white linen table runner. I cut each of the stems off of the faux bushes, eucalyptus & cypress to layer them around the birch logs. To cover the stems of the clipped branches I used the lose cotton bolls. 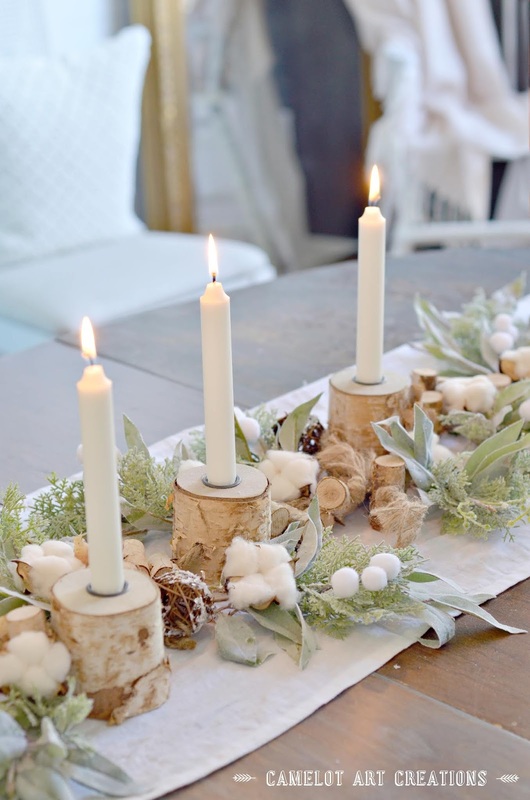 The pops of white remind me of snow balls for Winter and the small fuzzy white snow balls are perfect to bring variation in size with the white cotton. Mix in some snowy twig balls for texture and color variation and you have a beautiful Winter centerpiece! I'll be sharing a Valentine tablescape in a couple of weeks with some blogger friends and I'll be adding some LOVE touches soon! 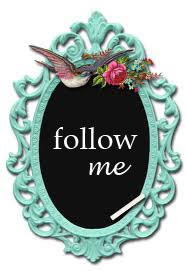 Hope you'll come back and check it out! What a nice way to have your table styled for winter. 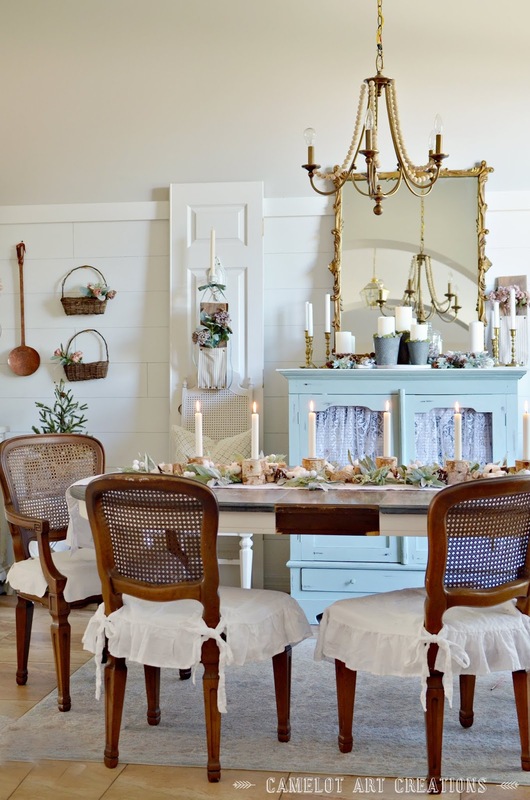 Your table is welcoming without being outrageous or too busy. I find it so difficult here in Florida to embrace winter, but you have done it well with this garland centerpiece. Thank you, Chloe! 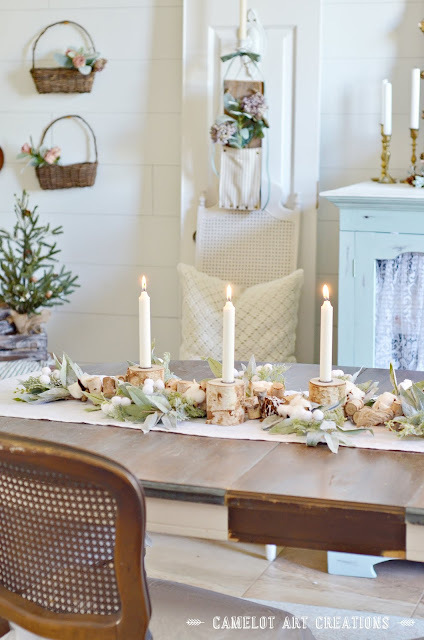 Yes, we don’t really get a Winter here so it feels silly to do “winter decor” but this will be used for Valentines & probably a little into Spring too!